This is a FREE service from Early Investing. Signing up for our FREE e-letter also entitles you to receive this report. We will NOT share your email address with anyone. In 2016, a little-known law was passed... one that leveled the playing field for average investors. Before, only millionaires could invest in companies before they went public. But today you can invest with as little as $100. You can now invest in the Facebooks, Snapchats and Ubers of the future. This is huge. For the first time ever, you can access a private market that was previously reserved for only the super-rich. And it’s easy. Just a few clicks and you’re in. That’s why we put together a report on how you can get access to pre-IPO investing. 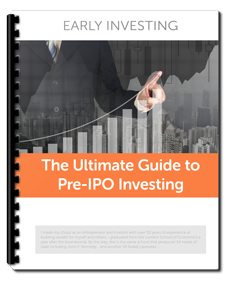 “The Ultimate Guide to Pre-IPO Investing” includes three top-notch portals for new investors. Just enter your email address above, and we’ll give you access to this valuable guide for free. You’ll also receive free access to Early Investing, a newsletter that keeps you on top of the early-stage investing world. Investing in the right IPO can result in astronomical gains of up to 1,000% and more. But what if you could get in before the IPO for even greater gains? Thanks to new legislation, everyday investors will soon have the opportunity to get in on these companies. But with the glut of new opportunities, how do you predict which will thrive? That's why we use our expertise to separate quality opportunities from junk. Our newsletter goes out twice weekly. It's 100% free and you can unsubscribe at any time. Early Investing covers the latest and developments in the startup investing world. Our newsletter goes out twice weekly. It's 100% free, and you can unsubscribe at any time.